Last week I went on a vacation to Disney World with my family, and I ate a lot of delicious vegan food while I was there. Before the trip I was little worried about what I would eat because this was my first time going as a vegan, and since I’m also gluten free my options are more limited. But I read up on the vegan options before I went, and most of the places we went to were accommodating. My family and I stayed at the cabins at Fort Wilderness, and our cabin was equipped with a full size fridge, stove, and microwave/oven combo. The night we got there, we stopped by a nearby Wynn Dixie (which was open until 12) and picked up some oats, fruit, soy milk, coffee, coconut coffee creamer, flax, and other breakfast foods that my Dad and sister wanted. I didn’t take advantage of our stove or microwave, but every morning I had overnight oats because it was quick and easy (and we were often waking up at 5am!) It was great to have oatmeal and quality coffee for breakfast every morning, so I never started out the day hungry. I also packed snacks to bring in to the parks–every day I brought berries or grapes as well as dried edamame, dried fruit, and Lara Bars because I didn’t want to get stuck without any options. Note: I have a mild gluten intolerance (I get a bit of a rash on my face if I eat gluten), but I don’t have Celiac, and it isn’t a huge deal if I eat a little bit. So I don’t always ask about gluten and just order whatever dishes aren’t made with gluten ingredients. Always consult with the chef for allergy information. Coral Reef offers one vegan option–a teriyaki tofu bowl2 with rice noodles, bok choy, shiitake mushrooms, and ramen broth. It was tasty, and I was really hungry after a day of traveling (we ate there our first night), but it wasn’t a must-try meal or anything. The portion was also small and pricey, but I was grateful we were able to find a vegan and gluten free option. They also offered Tofutti vegan ice cream for dessert, but I didn’t order any. We made a reservation at Tokyo Dining ahead of time after I saw they had a vegetable roll–I love veggie sushi! They didn’t have an allergy menu, but the manager came and talked to me and offered to have the chefs use separate utensils to make my veggie sushi. The sushi had carrots and cucumber with avocado on top, and I got steamed edamame as well. This was one of my fave Disney meals because it was not only vegan and gluten free but also oil free, healthy, and not too pricey. I was super excited when I found out that dole whips (and dole whip floats) are vegan! My Dad, sister, and I all got one the first day we went to Magic Kingdom, and they were so yummy! Tony’s had an allergy menu & kids menu (yay for allergy menus for reducing stress around ordering vegan & gf), and I got the rice pasta spaghetti without meatballs as well as a meatless bean fagioli soup. They also had a vegan salad option and sorbet for dessert, but I was super full from the pasta and soup. The spaghetti could’ve used some veggies and more marinara, but I was happy they had a vegan/gf pasta option. They also had vegan and gluten free bread. I asked for soy milk for coffee though, and they didn’t have any. 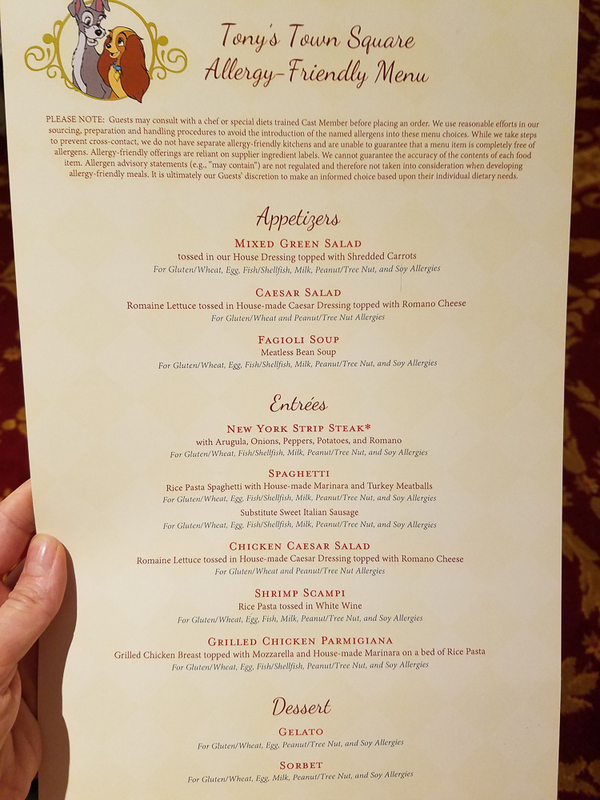 One day we had a character lunch buffet at Crystal Palace, and the chef came and showed me the vegan and gluten free options at the buffet: corn and peas, broccoli, green beans, white rice, edamame salad, carrots, and potato salad. It wasn’t a lot of options, but since I’m perfectly happy eating just rice and veggies, it was fine for me. Most of the veggies were cooked in oil3, and while I’m glad they have vegan options and don’t cook them in butter, I would prefer steamed or less oil. For dessert they offered me Enjoy Life allergy cookies, which were quite tasty! 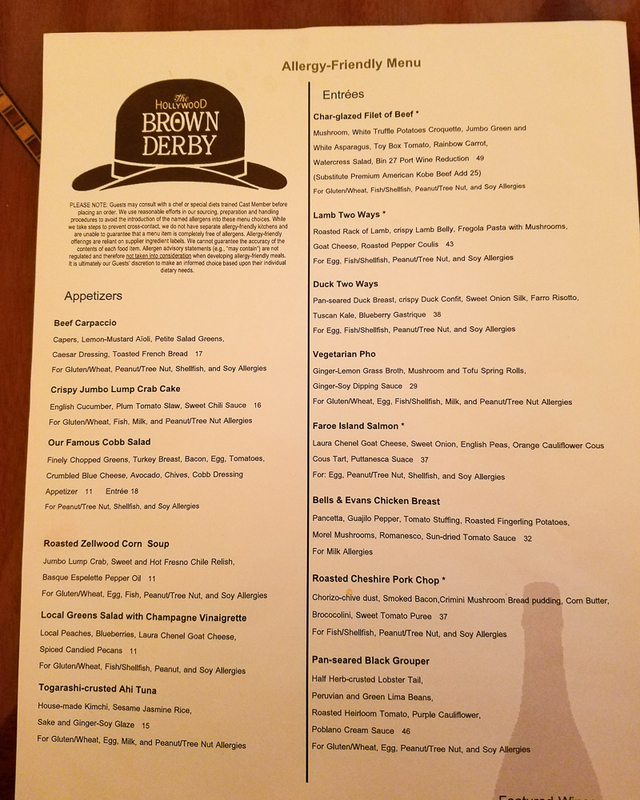 We had a reservation at the Hollywood Brown Derby, and I got the Vegetarian Pho off of their allergy menu, which had ginger lemon-grass broth, mushrooms, rice noodles, and it also came with tofu spring rolls and a ginger-soy dipping sauce. It was good, but hella expensive ($29!) for pho. The vegan dessert options were raspberry sorbet or fruit, but I was full from the pho. Still, again I was just happy there was a vegan and gluten free option, and I love pho. At first we were considering eating there again for dinner, and when I asked the chef about other vegan options he said he could create me something vegan with sides, but we ended up deciding against it since it was so pricey. One day I got Tofutti at Hollywood Scoops (it’s not on the menu, but you can request it.) I’d never had tofutti before, and it wasn’t as good as other vegan ice cream I’ve had, but at least they have a vegan option. 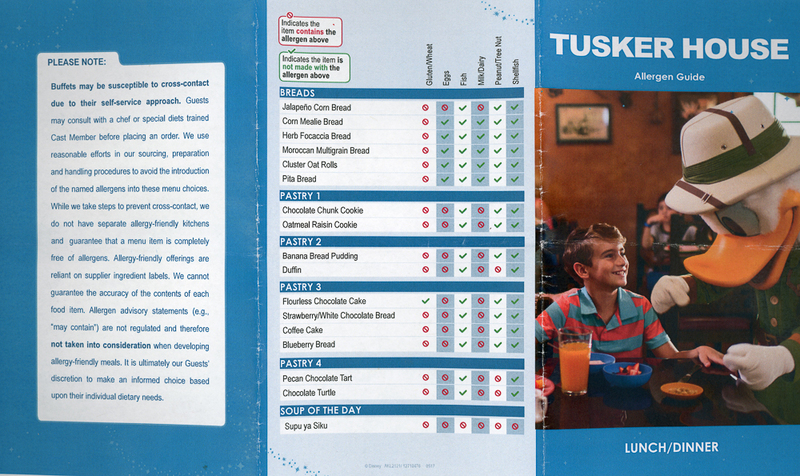 The day we were at Animal Kingdom, we had a reservation for a character lunch at Tusker House, a buffet with a lot of vegan options. The chef was really nice about showing me all of the options, and they also gave me an allergen guide, which I appreciated. The vegan and gluten free options consisted of Basmati rice, sauteed green beans, corn, collard greens, roasted carrots, roasted potatoes, plantains, black eyed pea salad, whole grain salad (with quinoa, kale, & cranberries with a mustard dressing), fruit, cold salad bar veggies (greens, olives, cucumber, tomato, & broccoli), garlic leek hummus, tomato hummus, applesauce, and pickles. They also had tofu and samosas, but the chef told me they’re fried in a shared frier, and I didn’t want anything deep fried anyways. 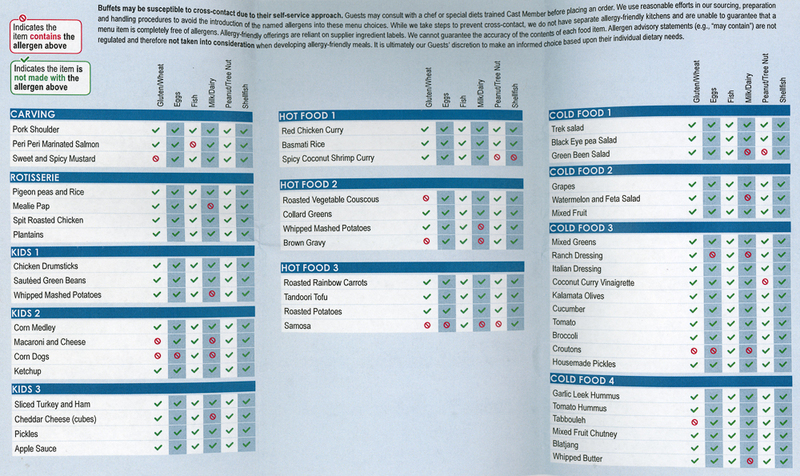 I also saw on the allergy chart that the samosas have eggs and milk so they weren’t vegan anyways. I filled up my plate and was happy to get some leafy greens and beans, which I’d been missing in the trip so far. Everything was good, and I especially loved the roasted potatoes and rice with lemon, cinnamon, and cardamom (I need to try making some soon!) They also had soy milk to go with coffee, and Enjoy Life cookies for dessert. We ended up making another reservation for dinner because they had so many options. We made a trip to Disney Springs for dinner one day so that I could get vegan and gluten free pizza and pastries, and I’m so glad we did because it was one of my favorite meals of the trip! The vegan/gf crust was delicious, and they even had vegan (Daiya) cheese. The line was really long, but worth it for me. After having pizza for dinner, we went to Erin McKenna’s, an all vegan and gluten free, allergy friendly bakery! They had so many goodies–my sister and I both got three mini brownie cupcakes–one with a berry frosting, one with chocolate frosting and cookie crumbles, and one with chocolate frosting and caramel, and they were SO GOOD. The cookie crumble one was my fave. I also got a slice of coffee cake (because y’all know I love coffee cake!) and a cinnamon sugar donut. Everything was seriously delicious–I felt like I had died and gone to vegan and gluten free heaven! This was one of the meals I was most worried about, and it also ended up being one of my favorites! I wasn’t sure what to expect since the dinner consists of family style all you can eat fried chicken, ribs, and other definitely not vegan foods, but they have an allergy menu, and the chef at Trail’s End, Chef TJ, is known for accommodating vegans and made me special dishes after I told him I’m vegan and gluten free. He brought me the same salad the rest of the table had (iceberg, tomatoes, and cucumber with Italian dressing), but with no cheese, and he added potato chips instead of croutons. He then made me a bbq roated potato dish that was absolutely delicious, and I appreciated that it came out at the same time as everyone else’s food. He also made me a gorgeously styled roasted vegetable plate with yellow squash, zucchini, portobello mushrooms, tomato, corn, rice, and some kind of glaze. It was absolutely delicious, and it was so nice to have an option made specifically for vegans. He also brought me vegan and gluten free bread with Smart Balance, and he said he was going to make me something for dessert but then either got busy or forgot, but I didn’t even mind because I was so full and satisfied from the other vegan creations he made. One evening we were planning on eating at Trail’s End, the sit down buffet at Fort Wilderness, but they were completely booked up. We were super hungry by this point and didn’t want to leave the resort for food if possible, so we decided to see if the takeout place could make me something vegan. 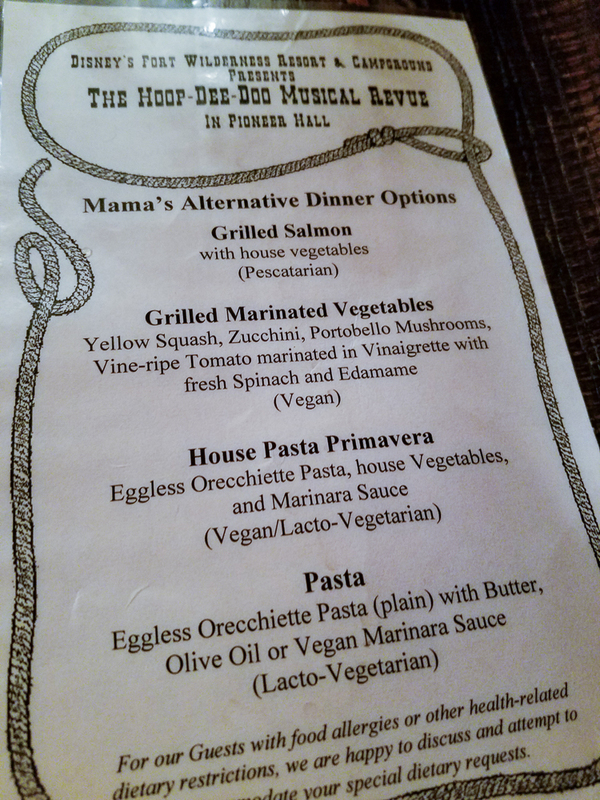 There were absolutely no vegan options or even options that looked like they could be veganized (not a vegetable in sight on that menu, seriously), but the hostess said we could ask the chef. After waiting in line to check out, we asked to speak to the chef, but after a few minutes of waiting, I realized we were holding up the line, and I told the rest of my family to order while I waited. The chef never came, but the manager did, and I asked if I could get a baked potato (because I knew they had them at the buffet), and he said he could get me a potato and grilled vegetables. That ended up being the cheapest meal I had while at Disney ($4), but I wouldn’t recommend going there unless it’s a last resort because it took a while for them to accommodate us. Also, I later saw that they sold raw potatoes, onions, and tomatoes at the gift shop, and if I would have known that, I would have baked my own potato, and it would’ve been easier and healthier! Luckily all of the parks now have a Starbucks, so every day I had an iced soy latte! As far as I know there’s only one Starbucks per park though, and depending on where you are it might be far away, so plan accordingly. I didn’t notice soy milk at any of the other coffee stands, though I didn’t ask about it. Update: The Joffreys stands in the parks have soy (even though it’s not listed on the menu)! Thanks Sarah! 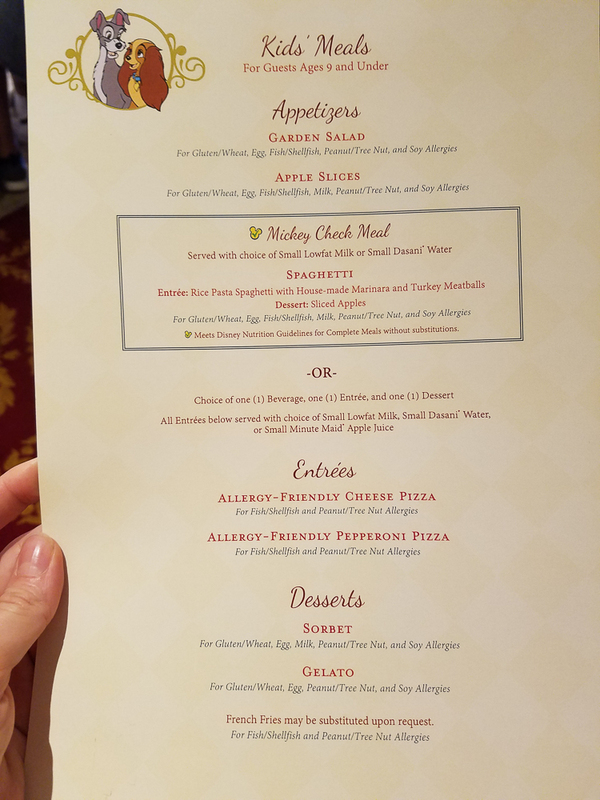 When eating out at Disney World, tell the hostess or your server that you are vegan and ask for an allergy menu or to speak with the chef, and they will accommodate you. Make reservations at restaurants ahead of time if possible and research the vegan options by reading Vegan Disney World. I also recommend bringing water and snacks into the park and eating a hearty breakfast before you head out. Some of my favorite must try vegan and gluten free meals during my trip were pizza from Blaze pizza and gluten free pastries from Erin McKenna’s at Disney Springs, Chef TJ’s vegan creations at the Hoop-De-Doo Revue at Fort Wilderness (he will also make you stuff at Trail’s End restaurant), the buffet at Tusker House in Animal Kingdom, Dole Whips at Aloha Isle in Magic Kingdom, and the veggie sushi at Tokyo Dining in Epcot. And of course, soy lattes from Starbucks at all of the parks. Have you been to Disney World? Did you find good vegan options? Let me know in the comments!